It's the Apres Surf Hoodie. I'm as far along on it as this photo shows, and have just realized that I've been putting an extra knit and purl row at the end of the pattern repeat. Doh. So my question is, do I rip and re-do? 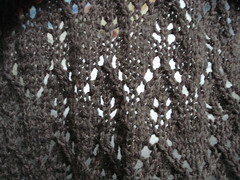 Do I keep making this mistake throughout the rest of the pattern and keep knitting happily along? Do I stop making the mistake, but not rip anything, hoping that nobody will notice the discrepancy? I'm inclined to just keep adding the extra rows and forge ahead. This is not feeling like one of those times where this is going to bother me enough as I go along that instead of ripping right away, I'll get the whole back done and then rip, thus wasting lots of time and knitting. The only thing that would stop me from doing that is if I really thought it would make the pattern look worse than what it would look like if I were doing it right. And I know that I'm really terrible at spotting mistakes, so that's why I'm asking your opinion on this. Sockyarn Blanket is coming along! 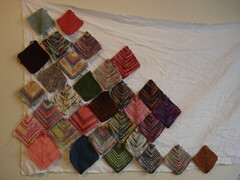 My question for knitters here is, how much variation between square sizes is okay? The smooshy and risata (peachy and blue squares in the bottom left) are rather huge compared to the other ones. And, gauge being the sticky wicket that it is, just about none of the squares are exactly the same size, even though I've been faithfully casting on 48 sts. I'm not ready to go and do something crazy like measure the squares or anything, but I'm considering ripping the obviously-huge-squares and reknitting those.